The ms Prinsendam Mediterranean & Aegean Explorer cruise spends many more days in port than at sea, or at least that is the schedule. Foul weather ahead will alter the Prinsendam’s scheduled stops after a call at Toulon, France. After embarking at Barcelona, we dock at Toulon the following morning. Regrettably, all the main attractions are a good distance from the port. These include the Old Harbor at Marseille and the Provencal city of Aix-en-Provence, usually pronounced simply as the letter X. Aix is famous as the home to Cézanne and for its 17th and 18th century buildings bordering narrow streets in the city center. Aix is known for its famous flower markets held on Tuesdays, Thursdays and Saturdays. Linda is most interested in the Saturday flower market, supposedly the largest, but the ship is docked on a different day. Having seen the day’s cloudy forecast, Linda is happy to forego Aix and for the walk around Toulon to view the food markets and other sights. 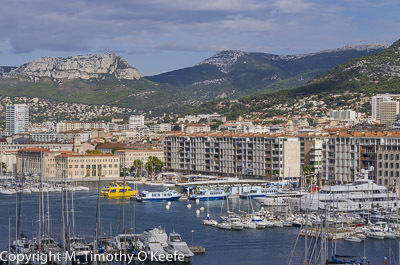 Speaking of views, we have an excellent one from the ship of Toulon’s harbor, marina and waterfront buildings. Toulon’s skies are kind most of the day, a mix of cloud and sun. It’s the last good weather we see for days. When most cruise ships leave a port, it’s customary to hear some sort of announcement about the weather and the upcoming day. On the Prinsendam, this is not done by the cruise director but the captain himself, who makes almost all of the public announcements. It’s not an ego thing but an obligation Captain Tim Roberts seems to feel is part of his job. More approachable and with a greater presence than almost any cruise ship captain I’ve ever met, Captain Roberts was born in Liverpool and resides in Scotland. His quiet, competent manner and daily announcements add real flavor to the cruise. We look forward to hearing his comments, which can be wry or serious or a bit of both. Tonight, he has bad news for us. We will not be able to dock in Calvi, Corsica, tomorrow as scheduled, which is disappointing. It is where Christopher Columbus was born. Calvi is one of two ports where tendering ashore is necessary. Unfortunately, the seas will be too rough for us to attempt landings in Calvi. However, Captain Roberts says he has an alternative port where the Prinsendam can dock: Ajaccio, Corsica, France, birthplace of Napoleon Bonaparte. Sounds good, trading one famous Corsican for another. And Bonaparte is far more interesting. However, the weather at Ajaccio also will be iffy with possible clouds and rain. Ajaccio appears a pleasant and compact town. We are not the only ship to deviate here. A big floating city with at least 3,000 to 4,000 passengers is docked near us. The Prinsendam is toy-like in comparison. That larger ship has lots more bells and whistles but we’ll visit ports later it could never enter, an advantage of small ships. 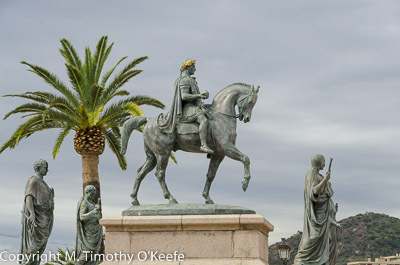 Napoleon is celebrated as a great hero in Ajaccio. A military general and first emperor of France, he is commemorated in monuments, street names and the Ajaccio Napoleon Bonaparte Airport. The entire Bonaparte family of the 1800s also is held in equally high esteem. The grandest monument of Napoleon is on the ocean side of the large de Gaulle Square (formerly Diamant Square). The statue depicts Napoleon on horseback dressed as a Roman consul and wearing a gold wreath. He is flanked in front and back by the standing statues of his four brothers, Joseph, Lucien, Louis and Jerome. Not far from the square is a simple but spacious house where Napoleon was born on August 15, 1769. He spent his early years at this house on the Rue Saint-Charles but never returned. The building is now houses the National Museum of the Bonaparte Residence in Corsica. After leaving Ajaccio, Capt. Roberts has an especially disturbing weather report for next day’s port, Olbia in Sardinia, Italy. Captain Roberts says the mayor of Olbia has issued a Code Red due to heavy rains that “could cause flooding and loss of life.” All cruise ship tours there are cancelled and passengers are not allowed to leave their ships. Instead of wasting a day in Olbia watching it rain, the Prinsdendam will continue to Rome, our next stop, to spend an extra day there. Unfortunately, the weather report for Rome is “heavy thunderstorms.” That is not surprising. BBC news shows show severe flooding in France and neighboring countries. We never receive news about the extent of damage (if any) in Olbia. Our first day docked at Civitavecchia, Rome’s cruise ship port, the weather is beyond dismal. The rain easily compares to some tropical storms. Those who try to reach Rome return saturated, and not by wine. A good number regret their outing. We have to be optimistic. The sun will come out tomorrow, right? Actually, it does.